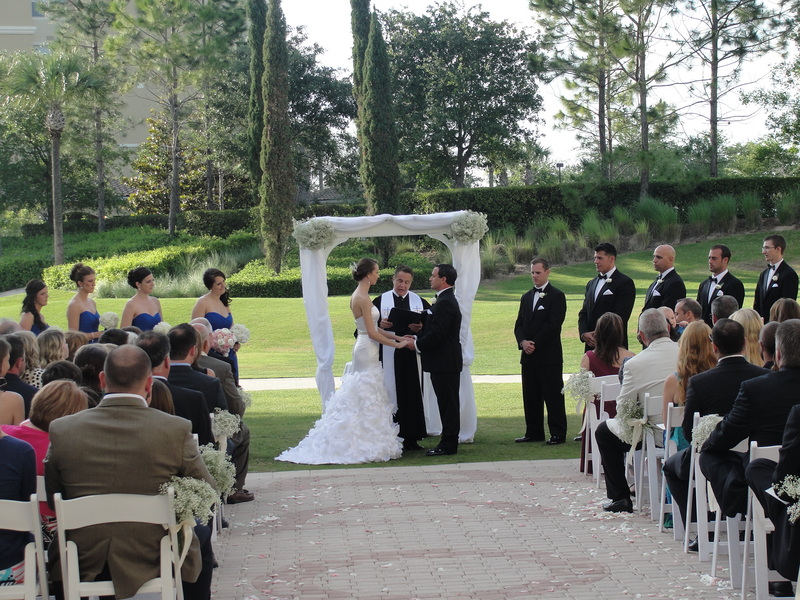 Robert Wagner and Kristin Luke were married on April 27, 2013 by Lon Tosi at the gorgeous Omni Resort in Champions Gate. The weather was perfect, with a blue sky overhead. The couple celebrated their union with a wine box ceremony. The box included their letters to one another as well as a bottle of wine. They are looking forward to their first anniversary at which time they will open the box, read the letters to one another, and drink the wine. They plan to continue with that tradition on an annual basis; adding letters each year. What a wonderful tradition they have started! We wish them all the luck in the world with their marriage. Blush by Brandee Gaar and Soundwave Entertainment were on hand along with Sensational Ceremonies to make this a successful wedding ceremony.